This week's exclusive offer with Rewarding Times, in conjunction with Great Music In Irish Houses, is a ticket for 2 people for the virtuosic Pavel Haas Quartet and Denis Kozhukin (piano), a glass of wine each, and a Festival programme. Since making its outstanding Irish debut at the 2007 Festival, this Czech ensemble has gone on to cement it's place in the first league of string quartets.On this occasion, their fifth appreance, the Quartet collaborates with pianist Denis Kozhukin, an exceptional musician who can list Renaud and Gautier Capucon, Jorg Widmann, and Alisa Wilerstein amongst his chamber music partners. In addition to quartets by Prokofiev and Shostakovich, the audience can look forward to a performance of Shostakovich's exhilarating Piano Quintet in No. 6 Kildare St, historical home of the Royal College of Physicians of Ireland. For 46 years now, the Great Music in Irish Houses Festival has been an institution in the Irish Cultural Calendar - entertaining, exiciting and exhilarating audiences through good times and bad. If great music is what you love, then that is exactly what you will experience at the 2016 Great Music In Irish Houses Festival. 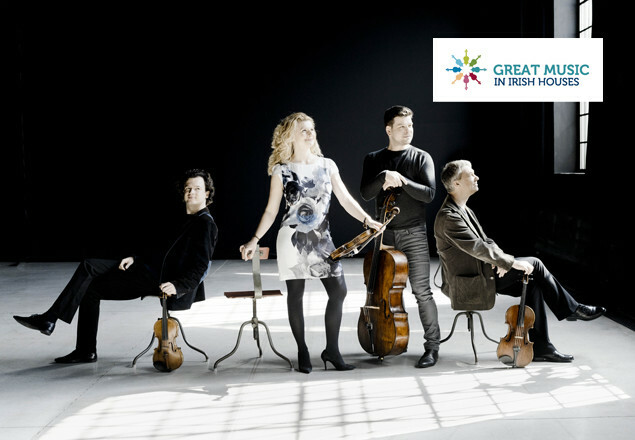 It has over 15 hours of uplifting and exquisite music and music-making from the very best chamber Musicians and soloists from home and abroad.Great Music in Irish Houses is particularly proud this year to be able to present a full programme of concerts that are as exciting and vibrant as any that have gone before. From venues such as Kilruddery House, and the hidden gem that is the Casino at Marino, to the newly refurbished Kevin Barry Recital Room at the NCH. Other venues are the Chapel Royal at Dublin Castle, the Dublin Writers Museum, The National Botanic Gardens, The Freemason's Hall, and No 6 Kildare St, the home of the Royal College of Physicians of Ireland. This should be presented at the Box and Office at No 6 Kildare St (RCPI) and your tickets will be redeemed against it. Multiple vouchers may be purchased, limited to 2 purchases per person.